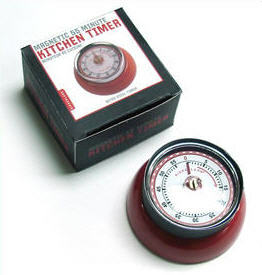 Kikkerland Black Magnetized 60 Minute Kitchen Timer. A Flashback of the old school timers.Retro look, steel with magnetic back. Rings for roughly 7 seconds to alarm you that the time is up! Attach to metal stove, fridge and more. The Larger Original Kit Kat Clock BC1 of the 30's reproduced and battery powered. The smaller version of the the original clock. Made this Kitty Kat Klock made in the USA.